Your Borough Councillor for Broadwater at your service. Vice-Chairman of Worthing Planning Committee, Joint Planning Committee and Policy Advisor to the Leader of Worthing Borough council, Paul Yallop. Member of Broadwater Community Association and Broadwater Neighbourhood Panel. Meet my colleagues, Cllr Bryan Turner (County Counclllor, Broadwater) and Cllr Vic Walker (Borough Councillor, Broadwater). Together the three of us are responsible for 4000 households in the Broadwater area covering everything from planning to licensing to education. Tim Loughton MP and Cllr Vicky Vaughan invited Michael Fallon MP (Minister of State for Business &amp; Energy) to Shoreham to talk to Broadwater, Worthing and Shoreham businesses. Michael Fallon asked how the Government could make things easier for business growth. Read his response. Vicky Vaughan secured S106 money for this lighting project on Kitties Field (Dominion Road) Recreation Ground. It allows children to play on the ground after dark in the winter months and has been very well received. Being a Worthing Borough Councillor means I am invited to many community events in and around Worthing. This gardening project was a fantastic social event and I would encourage Broadwater residents to join in: It's an inexpensive way of meeting new friends. Stagecoach launched its nightrider ticket to celebrate the increased frequency of its evening services on the Coastliner and Pulse routes in Worthing. The nightrider ticket costs just £2 and can be used after 7pm throughout the evening in Worthing and across the South Coast. This is excellent news for the local economy and customers alike, who can enjoy reliable travel at a great price, leaving them more money to spend on a night out in Worthing. Stagecoach also announced that it had frozen fares at 2015 prices and, for the benefit of commuters, has scrapped peak return fares. This means it is now even cheaper to travel to work. Stagecoach hopes that these incentives will encourage people to leave the car at home. Recent national research revealed that commuters can already save an average of £90 a month by using the bus to travel to work and play! The public consultation for new play equipment designs in Kitty’s Field took place earlier today between 3-5pm at the Community House in Dominion Road. It was well attended by many including your Broadwater councillors, residents and most importantly, the children. There were four schemes in total. The residents and park users got to vote on their favourite scheme. On 21st May at 3pm, there will be public consultation for local residents and children to provide feedback on three approved designs for brand new play equipment intended the refurbishment of Kitty’s Field Play Park in Dominion Road. I have already had a sneak preview of the designs which are really exciting and include climbing walls, basket swings, adventure slides and much more. Wishing I was young again! You are not required to stay for the whole two hours, just pop in and have your say on the design you like the most. PCSO Nicola Burstow, your local councillors and council officers look forward to seeing you there. Shortfall/deficit funding not linked to development of a specific artist; etc. The British Film Institute (BFI) has announced that the Film Festival Fund will no longer have deadlines and applications will now be accepted on an ongoing basis for the final two years of the programme. Now in its third year (2013-2017), the Film Festival Fund has £1 million in lottery funding to allocate in grants each year through two strands of funding. Strand One – supports film festivals of local/regional significance or those that address a specialist theme. The funding is for audience development activity within film festivals that offer a strong cultural programme and which serve local/regional audiences or which may have a particular specialist theme enabling them to reach audiences from further across the UK. Such festivals are usually focused on audiences and do not generally attract industry delegation. New festivals can be supported under this strand as long as they demonstrate a clear cultural vision which meets a gap in provision and are based on audience analysis and need and demonstrate financial viability. This funding is available to cover the next edition of a festival only. The average award is expected to be between £5,000 and £15,000 with an upper limit of £50,000. Strand Two – supporting film festivals of UK wide or international significance. The funding is available to support audience development activity at UK festivals that have an international or UK-wide reach and profile, enhancing opportunities for the UK film industry and internationally, as well as further increasing audience choice. New festivals will not be supported under this strand. Funding for single or multiple editions of a festival can be supported as part of this strand. The awards are anticipated to be for at least £50,000. The grants can be used for costs relating to audience facing activities at festivals, including publicity and marketing, film hire and transport, screenings and events, staffing relating directly to the delivery of the festival, venue hire for screenings and events, office costs and overheads directly relating to the delivery of the festival, filming of the event, and other costs. Charity or Trust registered with the Charity Commission (including UK universities). Community Interest Company registered at Companies House, Limited Liability Company, and Limited Liability Partnership. Higher education institutes (including universities) not registered with the Charity Commission. Full details along with the online application form can be found on the BFI website. The Hilden Charitable Fund has announced that its Summer Playscheme Grants Programme is now open for applications. The aim of the scheme is to help community groups run Summer Playschemes for the benefit of children from disadvantaged backgrounds. Some priority will be given to projects which show they are inclusive of children from refugee families, and show BME involvement. Funding of up to £1,000 is available for Summer Playschemes for children aged 5 – 18 years lasting for 2 – 6 weeks with strong volunteer support. The funding is available to voluntary agencies with an income of less than £150,000. Some priority will be given to projects which show they are inclusive of children from refugee families, and show BME involvement. Schools, individual students and teachers in the UK, that wish to buy musical instruments and equipment can apply for funding of up to £2,000 through the EMI Music Sound Foundation’s Instrument and/or Equipment Awards. The Foundations has made awards to over two thousand schools, individual students and teachers improve their access to music through the buy or upgrade of musical instruments and equipment. Schools need to use the funding for music education that is beyond statutory national curriculum music teaching. The Foundation cannot fund retrospectively and schools are not eligible for financial assistance under this scheme if they have already bought their instruments or if they do so before their application has been approved. In order to apply for financial support you must complete the EMI Music Sound Foundation’s application form. A new funding opportunity is available for schools and youth groups to bring young people of the UK and Germany together to facilitate an exchange of ideas, joint learning and open discussions on topics related to World War One. Open to applications from primary and secondary school teachers, trainees and youth workers, there is funding of £500 to £5,000 available for projects that have a high level of interaction between young people in the two countries, be it virtual or through a visit/exchange trip. The Radcliffe Trust has announced that the next deadline for applications to its Music masking grants programme is the 31st August 2015. Through its grant making programme, the Radcliffe Trust supports classical music performance and training especially chamber music, composition and music education. Particular interests within music education are music for children and adults with special needs, youth orchestras and projects at secondary and higher levels, including academic research. The Trustees respond to applications and also initiate their own projects. Applicants must be a registered charity or an exempt charity. The Birmingham Children’s Hospital which received £2,500 for a ‘Singing medicine’. Helping those with multiple and complex needs, to improving financial literacy. 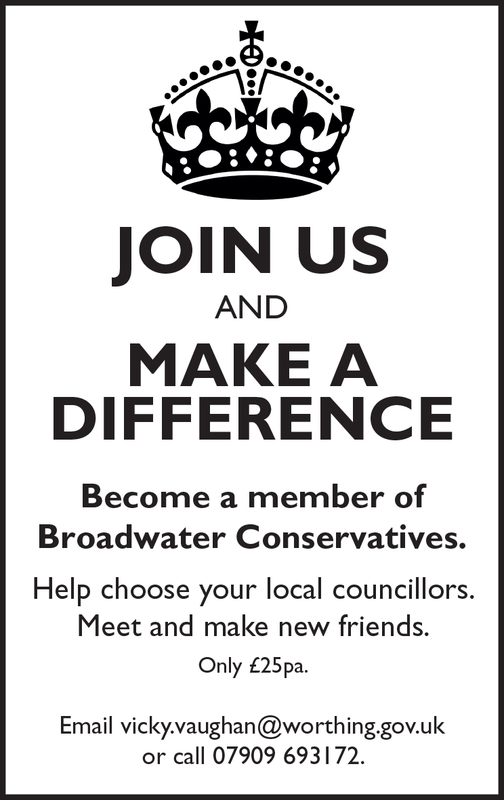 Do you want to make difference in Broadwater? Do you want a say in who is your local councillor? Call 01273 757182 or send an email to eastworthingandshoreham@tory.org and you will be sent a membership form. Before I was elected as a borough councillor, I launched a charitable organisation called ‘Talent Within You’. It raised money for children to develop their talent through training. Jack Ford, aged 18, from Worthing is a potential Olympic ice-dance champion and we funded a month of dance lessons with Diane Towler Green, British ice-dance champion. You may remember Jack Ford from 2010 when he opened the open-air ice-skating rink in Worthing with Todd Carty (links below) and he also won Splash FM Awards in 2010, Sports Personality of the Year. After two years of intensive study and ice-training, Jack has now been partnered with Daniella Alessi (British and Welsh senior champion 2013/2014) and they are 2014 British Couple of the Year. The couple has been picked to represent Team GB at Lillehammer in the 2016 World Youth Olympics and they will be busy training up until the event. Jack lives in Worthing and travels to Streatham Ice Rink on a daily basis to practice. He is staying in Worthing, with his family, so he can finish his education which is a requirement of Sports England. Jack has launched a fundraiser on INDIEGOGO LIFE, similar to Just Giving, in order to attract sponsorship and funding. The funding will be used for coaching and travel to the Internationals, physiotherapy fees, costumes, coaching, skates and blades. As a guide, skates and blades cost £750 and last for 6 months to a year. All businesses that support Jack will see their logo on his website, skate wear and receive regular updates of competitions and achievements. Jack would make himself available for personal endorsements and public appearances. Businesses will also receive a personalised certificate for their business records. Watch these YouTube movies to see how amazing Jack was 5 years ago. https://www.youtube.com/watch?v=-ETR5PmRYRU Tim Loughton MP and Vicky Vaughan talking about Talent Within You – we look so young! https://www.facebook.com/TalentWithinU (Talent Within You Facebook page – the charitable organisation Vicky Vaughan and Mike Pisko set up to help kids like Jack to nurture their talent). I hope to re-launch Talent within You in in a few years, but am currently concentrating on my business and Masters qualification. Jack is available for photographs – please call me on 07909 693172. Thank you for reading. I look forward to hearing from you soon. Left Todd Carty, Middle Jack Ford, Right Vicky Vaughan. Left Todd Carty, Right Jack Ford. Over the Halloween weekend, Sussex Police have had a number of burglary dwellings reported to them including one in Broadwater. If you have any information about any of these incidents please contact Sussex Police on 101 quoting the relevant serial number. Attempt break to premises over night, tool marks to dining room window using garden fork which has been found discarded in the garden and the padlock from the rear garden gate has been removed and found in another garden. No entry gained. At 17:35 hours on 31/10/2014 the neighbours to the address heard the alarm sounding, they informed another neighbour who entered with a key, they silenced the alarm but then noticed a rear window wide open with muddy footprints on the carpet. Occupants are away but appears no search has been made and no items stolen. 14:00-18:00 hour’s kitchen window removed using a bladed edged tool and an untidy search made where jewellery has been stolen. Occupants out for the day returned home at 20:00 to find rear patio doors smashed, very untidy search made, Jewellery and euros stolen. Rock found on kitchen floor which is believed to have been used to gain entry. Between 14:00 TO 00:00 hours occupants out of premises, returned home to see garage door has been forced and door leading to premises inside garage smashed through, untidy search made, jewellery and cash stolen.